John was the son of John Winchcombe (alias Smallwood) Senior - the famous Berkshire clothier commonly known as 'Jack O'Newbury' - and his first wife, Alice Hyde. He carried on his father's trade at his Newbury factory, but also took more of a part in politics. In October 1536, he was one of those to whom letters were addressed for aid in view of the northern rebellions. In February 1539, Miles Coverdale, when at Newbury, employed him as a means of communication with Thomas Cromwell who, in the same month, gave Winchcombe an order for a thousand kerseys of cloth. In the December following, he was one of the 'squires' appointed to receive Anne of Cleves and, on 12th February 1540, he was granted the manors of Bucklebury and Thatcham, besides some lands in Reading, all previously the property of St. Mary's Abbey there. On 4th February 1541, he was placed on the commission of the peace for Berkshire. In March 1541, he was leader of a movement among clothiers to protest against the provisions of the statute of 1535 dealing with the manufacture of cloth. The council stayed the execution of the statute and directed Sir Thomas Gresham and others, who had procured it, to prepare for its defence. On 20th January 1545, "John Winchcombe, gentleman, of Newbury" was returned to Parliament for West Bedwyn in Wiltshire. In 1549, he was granted a coat of arms and, on 8th February 1553, was returned to Parliament for Reading. Three portraits of the younger John Winchcombe, all dated 1550, were exhibited at the Tudor Exhibition in 1887. The best known is that now on display in the West Berkshire Museum. The original is owned by John Winchcombe's descendant, the present Lord of the Manor of Bucklebury; and there is a third at Sudeley Castle in Gloucestershire. 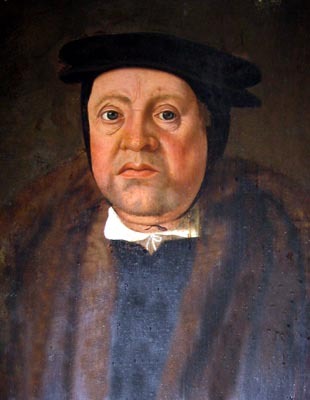 It may have been John's son and namesake of Henwick Manor (Thatcham) who, as "John Winchcombe Junior" represented Ludgershall (Wiltshire) in the parliaments of 1554 and 1555 and was, in the latter year, directed, with Dr. John Story, to maintain order at Reading Fair and, in Queen Elizabeth's reign, was suggested, by Bishop Parker, as a commissioner in Berkshire to prevent the scarcity of corn. Although, John Winchcombe II was one of those who, in 1556, sat in judgement of the protestant Jocelyn Palmer of Reading and, on behalf of the Bishop of Salisbury, condemned him to be burnt at the stake. The Winchcombes lived at Bucklebury House until the family died out in 1720. Their descendants, however, are still in residence today. Edited from Sidney Lee's 'Dictionary of National Biography' (1900). Portrait reproduced by kind permission of Mr. Willie Hartley Russell.